Since last weeks Image of the week by Josephine Meckseper had so many interesting thoughts and comments.. Thanks much, very appreciated for all whom commented.. let's try this again this week. This weeks pick, is by Artist Ryan McGinness. He has made some really fanciful "Paintings." Ryan's work is included in some of the most prestigious museum collections around the world. The image is named "Arab Cadilac Generator" and is acrylic on wood panel, 48inches in diameter. For anyone going out to East Hampton this summer, Ryan McGinness has an impressive show of new work at Glenn Horowitz Bookseller on Newtown Lane, East Hampton which is on view till July 3rd. Plus Rizzoli published a book last year, Ryan McGinness, Installationview. OK MAO painting experts.. what do you think of this painting and the Ryan McGinness work? Love it or hate it? Trash or Treasure? A Great visionary panting or just a simple graphic doodle? Lots of emotional image depth, or just a typographical flourish which belongs somewhere on the margin of a hallmark card? Clinical graphic gimmicks, or contemplative fields of intimate meditation? Revolutionary artist to be collected, or passing commercial fad, just an icon of the over hyped age of contemporary art? While I have to say, these drawings/paintings look much better in person, than on line, I think I'm still very much on the artistic fence when it comes to liking these. ugh, I mean it's ok, compositonally not bad, but way way way too slick. His show at Deitch became overwhelming and obnoxious without much emotional resonance and depth. Everything looked the same, same trick, same style, no depth. It's Ad art masquarading as Fine Art. And hey I like Ad art, I make it myself, but I don't want to see it at the friggin MOMA, I can't believe the hype has extended over to there. I can't wait for the next column which is: "Next time, another price-related question: Is the price that a gallery publishes the price you should expect to pay?" That's a question burning in my mind. Many prints I've bought I've gotten the customary 10% off from the gallery-sometimes without even asking. But some galleries are headfast about no discounts unless they "know you." What is everyones experience around here? 10%??? More??? Or the old "well the market is brisk blah blah, hurry before it sells out..."
I can't wait for the art market to crash so I can play hardball with them. or a mini-bar custom paintjob. Philip Taaffe for the oh so cool kid set. When I first started this blog..I wrote about Gallery Discounts.. check out..
Wow.. so that's 4 out of 4 expert opinions..all thumbs down!.. no one has a kind word for the work of Ryan McGinness!! But the new show, out in East Hampton was almost completely sold out..
Then, who's buying it?? Why? I'm not an expert, just a snob. But I'll side with the other commenters - looks nice, but there doesn't seem to be an aniamting idea behind the doodles. It may look better in person. Could it be that it doesn't reproduce well on web page? Great visionary panting or just a simple graphic doodle? This is a false binary. This makes it sound like typographical flourishes dont have a place in the history of art, or that they are not worth having in the first place, and that emotional large depth cant have aesthetic power w/o "emotional image depth". McGuiness reminds me of an excellent postmodern updating of all sorts of things; of kufic plates, medieval illuminated manuscripts, edo era japanese albums, classical chinese landscapes, mid 20th century french and swiss iconographic design; persian manuscriptis; 21st century commerical designs...this abstracting and synthesizing the aesthetics of language are really quite interesting. his work isnt clinical, its too messy and colourful to be messy. i also dont think its contemplative fields of anything, it doesnt have the fluidity or liquidity of much calligraphy---it doesnt have the seductive or functional eyefeel, lets say. So, by making decorative work less about what is being said and more about what is being looked at, its decorative but thats a fantastic qaulity sometimes. I agree with most other comments here, his work is a bit "small". For me, it lacks the depth and scale (maybe physical and content-wise) that other artists have--Julie Mehretu for example. It would be nice to get more info on Mr. McGuinness, but relative to the amount of commerial work there is to see AND buy online, there isn't much to read. Perhaps that is evidence enough. I think this work in particular is a failed attempt to transform his design work into art work, and I haven't seen anything else that really proved he was capable of that transition. As well, I don't understand his choice of medium. Acrylic on wood panel? Why not print it? I feel like he is offering a token format to pass his work as art. I think you're all wrong and being way too nit picky. 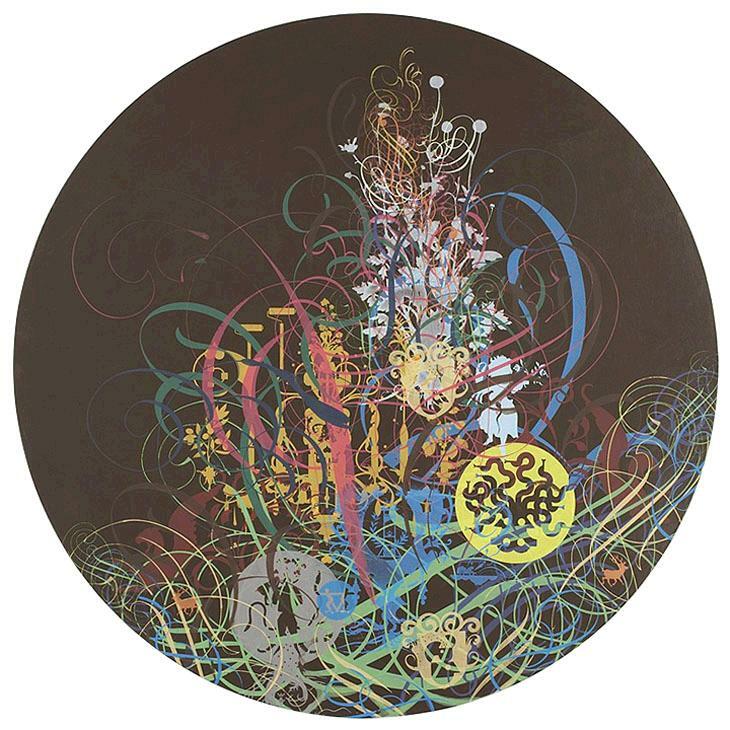 Ryan McGinness work is thoughtful, yet, beautiful. He's a fresh voice in the new world of dull figurative painting. Most certianly an important artist, to be collected! I agree with Christine. It's a great painting. Anthony has no idea what he's talking about, and he's too busy using "see how smart I am" words in his comment to hide his errors! McGinness is not a dead end. He's already in MOMA, and we're just starting to see his best work. how am i wrong, rich? Gorgeous wallpaper, boring art. Would love to see it as upholstery fabric too. Actually just bought his book in hopes of learning the intellectual angle that I just knew I was missing … oops, turns out there is none. Not such a great book either. a lot of us are sick of people who treat art like stocks. Your premise here is "I don't get it"-------how true. Great Work. Ryan has his own style, instantly recognizable. Also, a lot of the buying here is coming from the young people who are starting to make money, and who are the same folks who collect toys, sneakers, shop at KidRobot etc. What does all that mean? I don't know. But the audience is a bit different than for the usual art market. Sure, there's a couple people round here who like it. And it is a pretty picture, well composed and executed. He has talent. I'd hire the guy to do some illustrations/marketing campaign work. But what does it offer to the art world on an intellectual level? Not much in my mind. I think it's formally well done, but just that. He seems to be going for a thicket / dried weed effect, which is a good idea, but the imagery and color is too tasteful (retaining the regal look of the ornamentation and shields) and inorganic to suggest some natural content. I think this kind of thing works better in a context where it decorates/marks something, like bodies (tattoos), surfboards, cars or signs. Indoors and on its own, it reminds me of the painted glyphs Eliot Pucket (sp?) did -- sensuous, but maybe too handsome for their own good. (I don't mean this in a PC way at all, but in line with the purely-formal vs. content/meaning issue with the images...) I get arabesque + Cadillac logo, and there IS a Cadillac dealer in Arab, Alabama (I just looked it up), but... just what is the term "Arab Cadillac" meant to suggest? Nah, the first posters were right. High gloss, well crafted, utterly vapid. It will sell well and date faster than a pint of milk in the sun. We featured Ryan in our 4th issue of Art Prostitute back in 2004. To date it is probably one of the the best interveiws we have done. Here is a link to his resource page on his site http://ryanmcginness.com/resources.html you can download the pdf of that interview there. He says a lot of really pertinent things about the movement of art which he is steering straight into museums. His installations alone merit the attention he is getting from the museum world, and are a direct attribute to where his career is now. Most certainly one of the artists to collect, but don't wait too long or you will be bummed, as it is only going up from here. "What I want to be most careful about is inflating or fabricating value." -- from Art Prostitute interview. I'm a big fan of his tapestry works. And I like his style... not priceless but thoughtful. Typically users of airline cards are financially well off and travel frequently. This is because of the post dated cheque that secures the loan. These tools and solutions may include educational materials, workshops, and budget worksheets. welcome here to [url=http://www.coolingame.com]wow power leveling[/url]. just try our best to do anything. None that I am personally aware of, but I have never used an iPhone or iTouch. I did a Google search for iPhone wifi and came up with these[b] [url=]good tips[/url]http://iphonenow.info/edge-wifi-use-on-your-iphone-how-and-why/[/b] that might help you out. Come on this site, you will find many interesting on it!